Motto: "Not Power but Skills"
in fixed, portable and mobile station. and individual radio operators in most-wanted areas. I'm a Low Power - QRP - QRPp Enthusiast on 26 & 27 MHz. but who work in point of feet". in proportion to the power used. The DX is nice if it is "sweaty" and should be worked with a certain rationality. Height is a much more important factor of power: "at a height of one thousand meters, with just one watt in antenna, you can make more QSO-DX that with a thousand watts to one meter in height!" 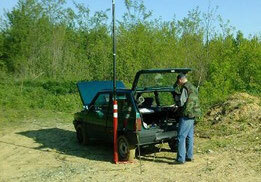 (20W max) combined with wire and vertical antennas self-built. I also use a PolMar CB309 - QRP 0.5W AM / 0.8W SSB. I don't use power amplifiers and directional antennas. if your Callsign is in my Log, that's what's important and not a piece of paper. collecting QSL cards is definitely secondary. Each QSO represents a possible Friendship, not a possible QSL exchange. not a QSL, not the race to the DXCC. "The ability to make (and keep) many friends on the band, is the most powerful capability of your radio. This can only be achieved through QSO, not QSL". 11m & QRP...bring it on! !